After all the years we have lived in the Washington area, this was our first visit to the Capitol Hill staple Bistro Bis. 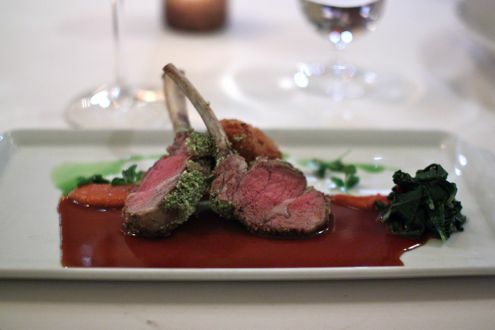 We were looking to spend an evening out for Valentine’s Day without paying an extraordinary amount on a prix-fixe menu, and Jeffery Buben’s bistro happened to be offering a la carte options and had availability. 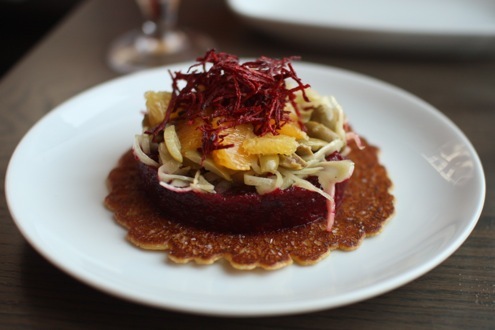 Additionally, Bistro Bis recently cracked the top 20 of Washingtonian’s 100 Very Best Restaurants of 2016, further piquing our interest. 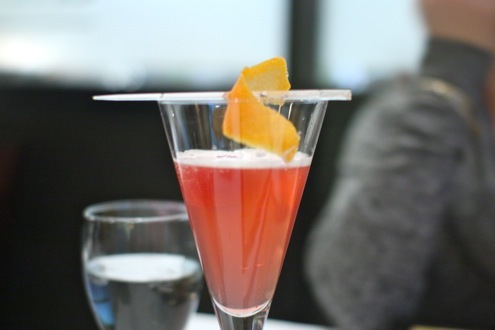 One thing I love about restaurants is when they offer an assortment of non-alcoholic cocktails. Given that Rachel is currently pregnant (apologies for the lack of formal press release), we asked our waiter if they had any mocktails available from the bar. He came back with a tropical hand-shaken cocktail, poured right from the strainer, into Rachel’s glass. It was a very nice touch. 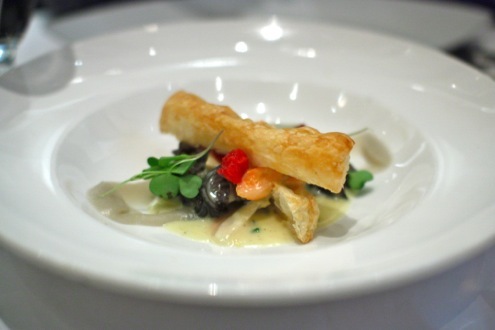 We kicked things off with a French classic, escargot. 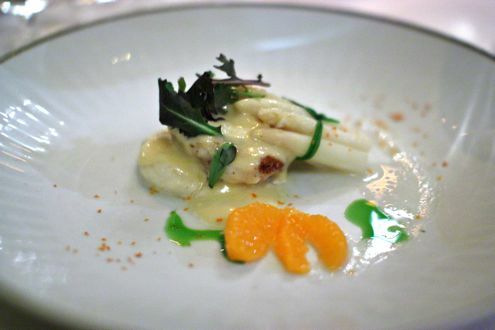 This preparation, however, was a deviation from your typical butter-drenched snails and instead was presented in a lighter fashion of garlic, sunchoke purée, fennel, Seville orange and topped with a puff pastry. It was a welcome change while we both marveled at the gorgeous presentation. For our main courses, I opted for the Icelandic cod à la Barigoule. 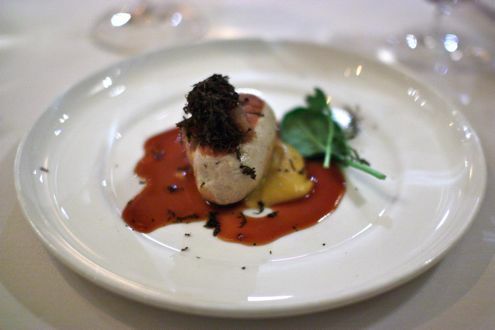 The perfectly cooked potato-crusted fish was placed atop a bed of parsley-spinach purée and accompanied with baby artichokes, sun-dried tomatoes, and drizzled with tapenade vinaigrette, not to mention what tasted like potato-flavored foam. I have to admit that it’s been awhile since I’ve seen foam, but it was a welcome if not aesthetically pleasing addition. 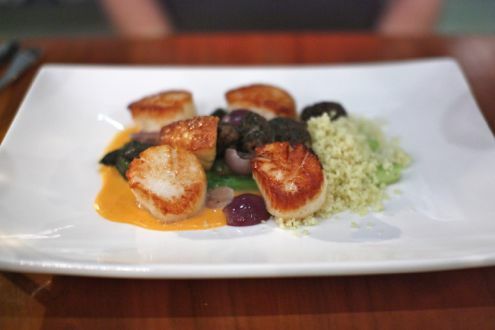 It’s hard to know if Rachel was more blown away by the presentation of the Sea Scallops Crecy or how the flavors worked so wonderfully together. 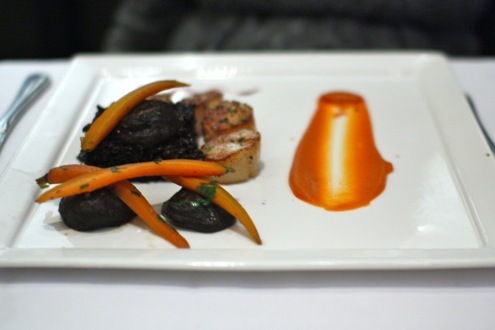 The scallops were seared along with coriander-roasted carrots, black forbidden rice, a carrot purée, and smoked shiitakes. 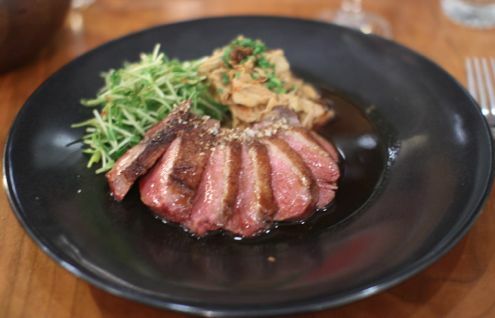 The best part of the dish had to be the shiitake mushrooms, as they tasted so smoky and meaty in such an intriguing way that she savored each bite. The overall dish was a far cry from a traditional French meal, but she loved it. For dessert, we shared the Profiterole au Framboise. 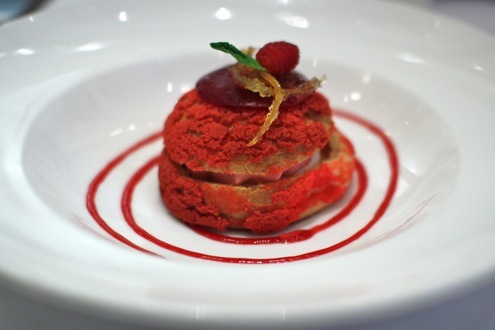 The appropriately colored for Valentine’s Day choux pastry was stuffed with raspberry mouse and vanilla ice cream, and then toped with a raspberry coulis. 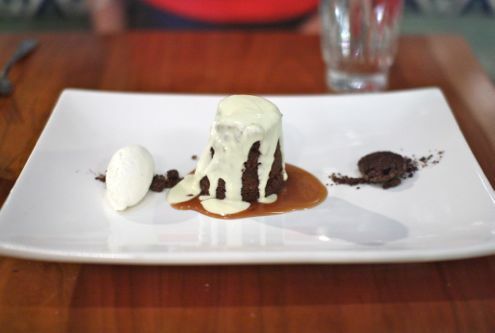 It was a sweet and filling dessert that made for a great ending to a terrific dinner. I’m still amazed that this was the first time we have dined at Bistro Bis, but it certainly won’t be our last. 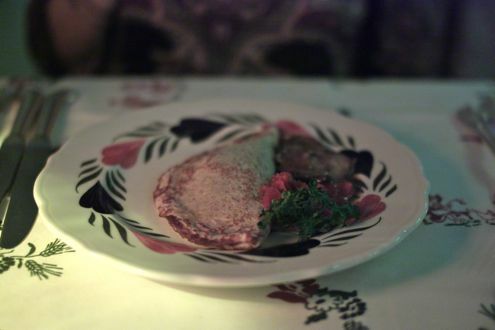 Considering that Rachel and I are the only ones in the DC foodie blogosphere who still haven’t been to Stephen Starr’s bustling brasserie in the ever-growing 14th Street Corridor, we finally booked a reservation for Le Diplomate the week before Valentine’s Day. 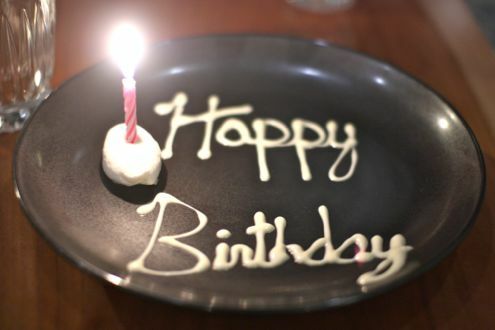 We decided to celebrate the holiday seven days early, as we wanted to avoid the trap of prix-fixe menus and overpaying for a meal, especially that we have also have to spend extra for a babysitter these days. With repurposed materials being all the rage in new restaurants, the interior of Le Diplomate is absolutely stunning. You would never know that it was the site of a former laundromat, let alone open for a little under a year. The moment you step inside, you’re instantly transported to a classic French bistro that looks like it’s been open for business for decades. After a drink at the bar, we were seated at a lovely booth in the corner of the dining room. 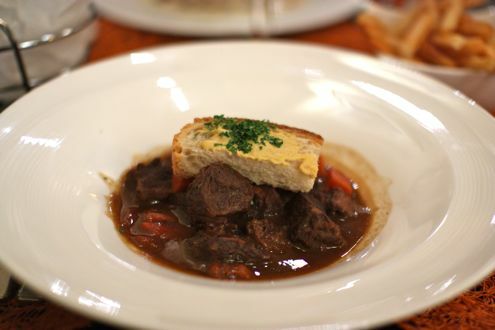 Great for couples, we had a view of the entire restaurant and watched as servers were jumping from table to table delivering some French classics like escargot and Onion Soup Gratinee. 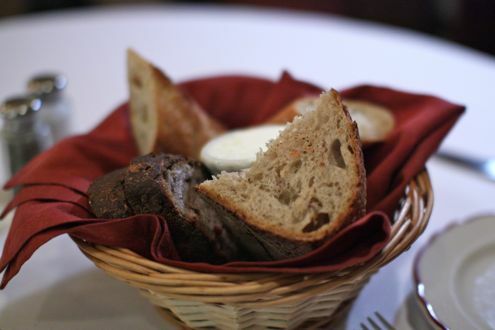 While reviewing the menu, our server dropped off their famous bread basket. Overflowing with three different kinds of bread, ranging from sourdough to a classic French baguette to my favorite, cranberry walnut, it’s no wonder why Le Diplomate (along with Rose’s Luxury) features one of the best complimentary bread baskets in the District. For our appetizer, Rachel and I decided to split the mushroom tart after hearing such glowing recommendations from friends. 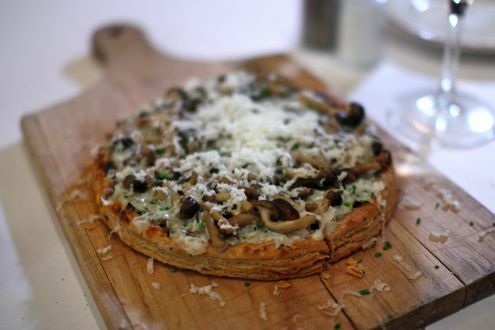 Arriving to the table at room temperature, the buttery, flaky crust combined with the pioppini mushrooms and grated truffle pecorino made for an outstanding first course. Perfect to split between two people, it’s a great if not filling dish. 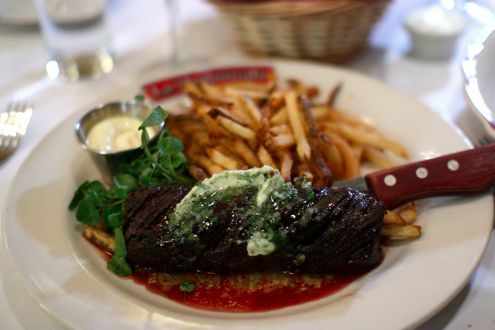 As for our entrees, considering that this was our first ever visit to Le Diplomate, I simply had to go with the traditional order of steak frites. Prepared medium rare and served with two handfuls of crispy pommes frites, the pan-roasted hanger steak was topped with a hearty amount of maître d’ butter resulting in a smile to my face. There’s a reason why this is one of their bestsellers. If I wasn’t biting in the succulent, buttery steak I was dipping the crisp frites into the accompanying side of mayonnaise. You can’t go wrong with this dish. 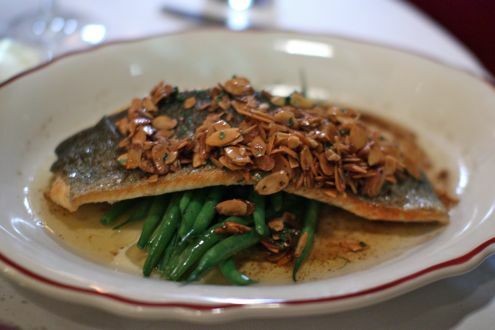 Rachel, who already felt somewhat full after the mushroom tart, opted for a “lighter” entrée in the Trout Amandine. 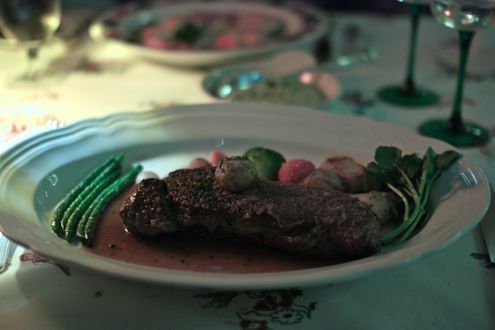 The filet was layered with almonds and sitting in a bed of haricots verts and cooked in a brown butter sauce. 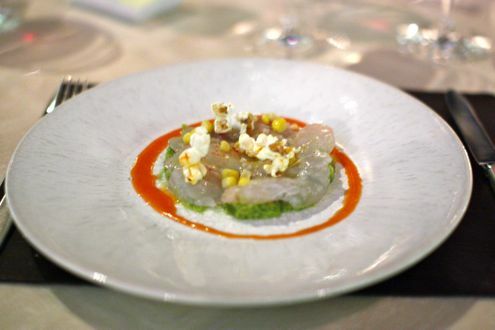 While the fish was nice and moist, the sauce had an overpowering flavor of vinegar that detracted from the overall taste of the dish, not to mention the overabundance of butter used. Not sure if it was a bad night in the kitchen, but it was slightly disappointing as Rachel regretted not ordering the Beef Bourguignon instead. Despite the snafu, we had a lovely time as the atmosphere made for a romantic evening. 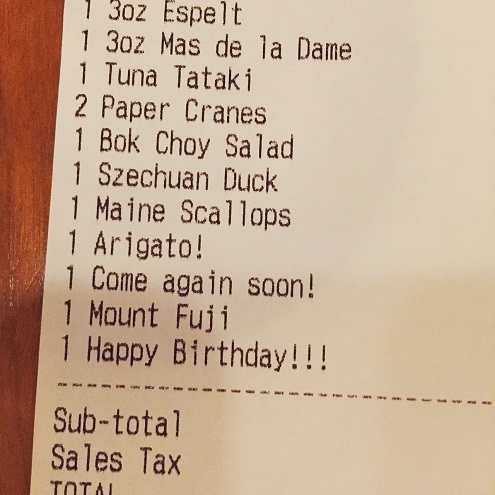 The service was great if not a little rushed, but then again, we left at 10pm and people were STILL waiting for tables. One thing is for certain — Le Diplomate is a legitimate cash cow. No wonder we had to book a table a month in advance. 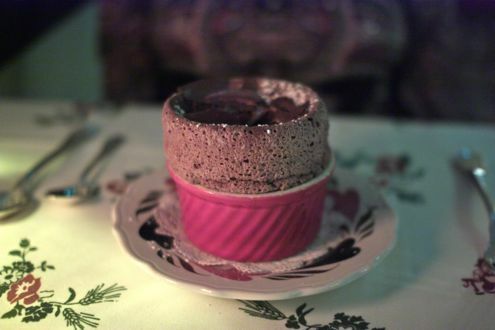 A few weeks ago, Rachel and I headed out to The Palisades neighborhood for an early Valentine’s Day dinner at Et Voila. 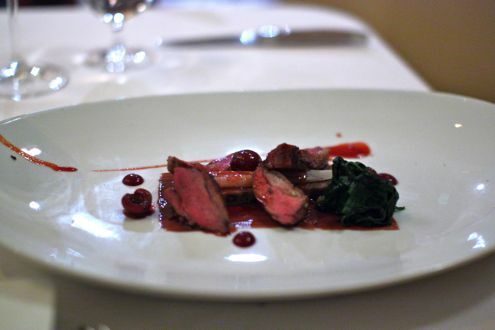 We wanted to venture somewhere we haven’t dined before, but that was also romantic, and Et Voila fit the bill nicely. The space is very intimate, situated in a rowhouse with tables solely on the left and right of the house with a narrow aisle in the middle separating them. It’s a tight fit, so don’t even think about bringing your baby here. Good thing we had a sitter that evening! The menu focuses around French and Belgian cuisine, and while we’re always a sucker for mussels, we wanted to explore some of the other dishes the restaurant offered. We started the evening off by splitting their warm goat cheese salad. 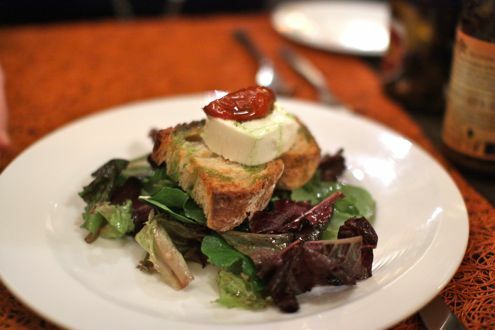 Situated atop of bed of greens, the generous block of warm goat cheese was sitting on a slice of warm French bread and topped with a sundried tomato. It was a fantastic way to kickoff our meal as we loved every bite. Highly recommended. For our entrees, I ordered the Flemish beef stew. 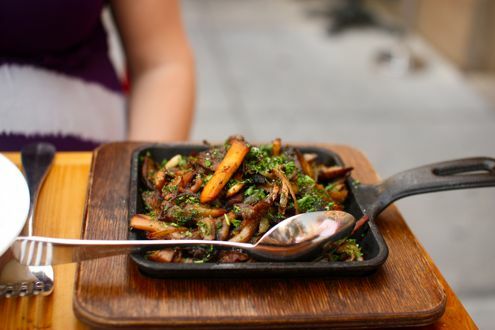 Simmered in dark beer and served with a side of their pommes frites, it was pure comfort food. Given the cold, dreary weather that day, it was a perfect choice. 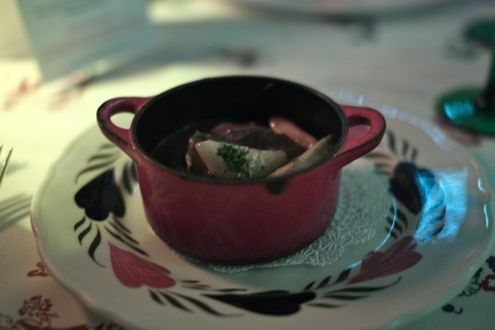 While the meat was flavorful and tender, it more resembled a bowl of beef chunks than an actual stew. Not that it wasn’t good, but it wasn’t the hearty stew I envisioned when originally ordering it. 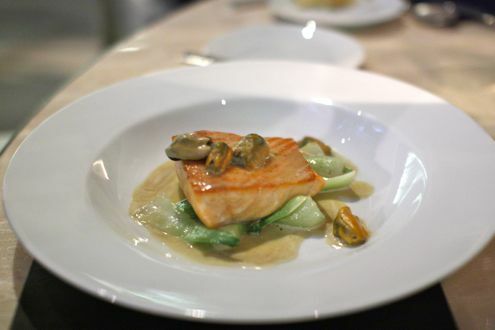 Meanwhile Rachel ordered the grilled trout, which was accompanied with leeks fondue and a champagne sauce. 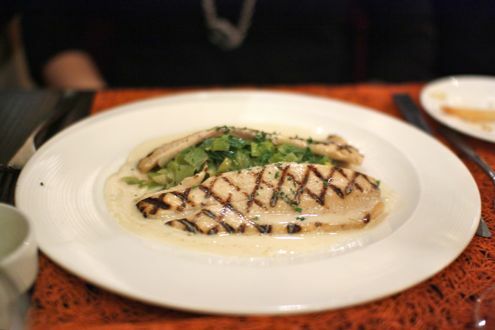 The perfectly grilled fish, adorned with beautiful grill marks, paired nicely with the creamy leeks and light sauce. 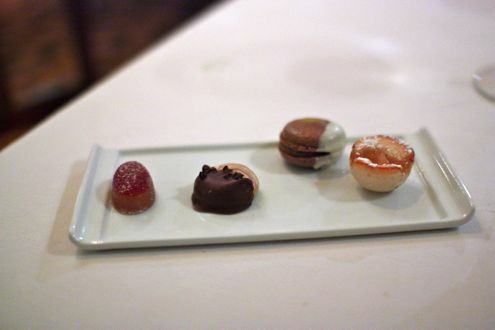 Given our incredible knack for indecisiveness, we asked our waiter what he recommended for dessert. He immediately suggested the chocolate mousse. The waiter was right on the money as the mousse was indeed heavenly. 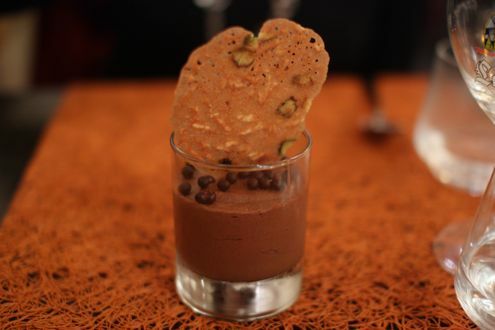 Beautifully presented with a thin almond pistachio cookie “dunked” into the mousse, it was smooth and rich. We left Et Voila with a smile on our face. Not only did we get to enjoy an excellent meal without the Valentine’s Day rush, but we discovered a new restaurant that we would happily return to. And once we’re feeling adventurous enough, we will have to try the mussel burger. Yes, there’s a mussel burger on the menu. One of the District’s most buzzed about restaurants since opening in the beginning of this year was Adams Morgan’s Mintwood Place. From critical acclaims (it made Tom Sietsema’s Fall Dining Guide) to presidential visits, executive chef Cedric Maupillier has delighted diners with his eclectic blend of French and southern American cuisine. Mintwood Place has been on our bucket list of restaurants to visit since they first opened their doors in January, but it wasn’t until a late August day that we finally made our way over there. We decided to dine out on the patio as the weather was perfect for an outdoor dinner. 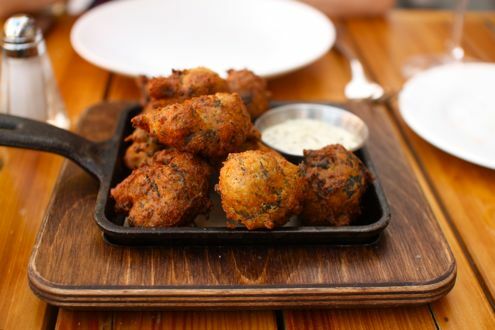 The menu adds a French twist to southern classics, as was the case when we decided to order a plate of escargot hush puppies as an appetizer. And if you were curious, they were as delicious as they sounded. 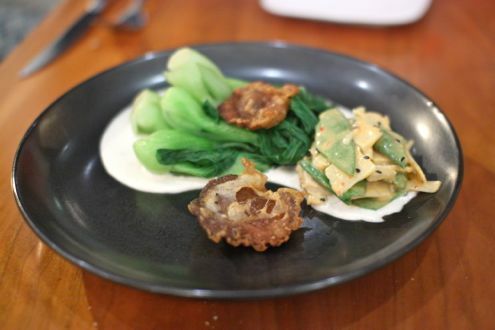 Wonderfully crispy on the outside and delicately rich on the inside, it’s a clever dish that’s well-executed. Generously-sized portion, too. We took some time deliberating over what to order as the main course, but instead of each ordering a different entrée, we tried something different and opted for the roasted pork for two. 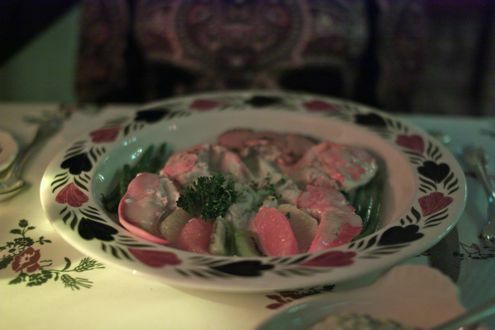 It turned out to be a very good choice as we were served a mammoth platter of sliced, succulent pork. 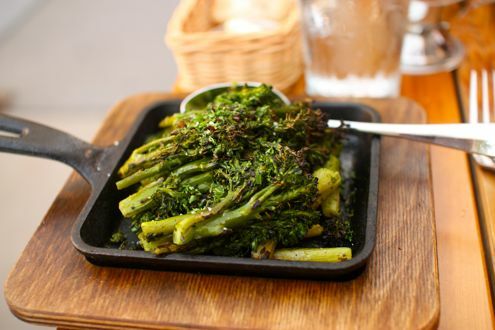 Accompanied with a roasted mound of garlic and housemade charcutiere sauce, you also have a choice of two sides, so we ordered the broccolini and roasted mushrooms. Both were very flavorful side dishes and complemented the juicy pork. 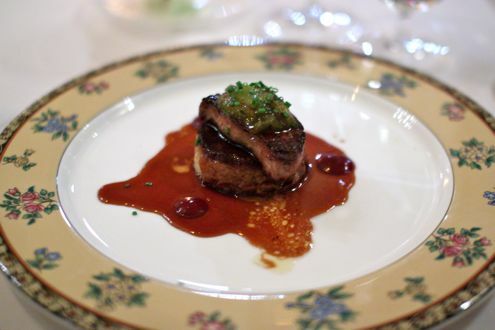 Blending the roasted garlic with the charcutiere sauce and gently spreading it over the pork greatly enhanced the dish. Considering that the restaurant’s other entrees average around the mid twenties while the side dishes are a la carte, $46 is a very good value for the platter when you factor in the generous portion of pork and duo of sides. 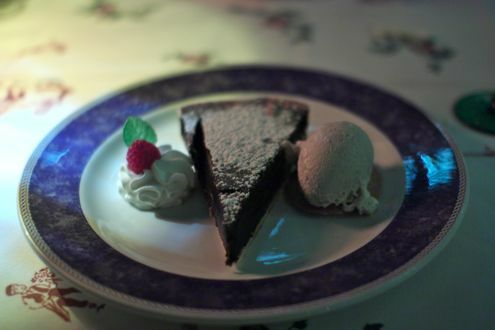 In fact, we were so full from our main course that we had to pass up on dessert. Nonetheless, the service at Mintwood Place was exceptional. 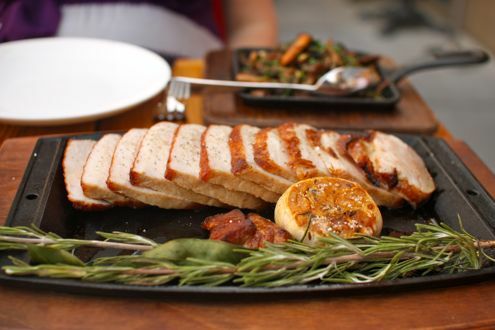 Our server not only knew the kitchen’s preparations by heart, but he also helped steer us in the right direction by recommending the roasted pork. 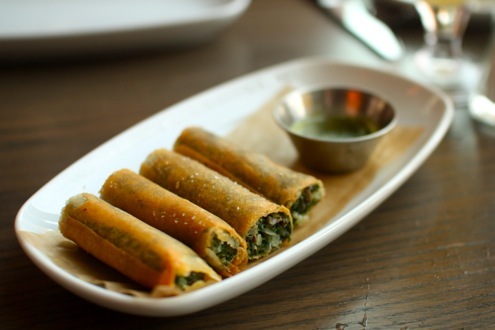 Mintwood Place is an excellent addition to Adams Morgan and is one restaurant we would wholeheartedly recommend. Rachel and I were rather strategic about this year’s Restaurant Week. We wanted to a) dine somewhere we have never been to before, b) make sure the $35 price tag was worthwhile, and c) eat at a place that offered the full menu. 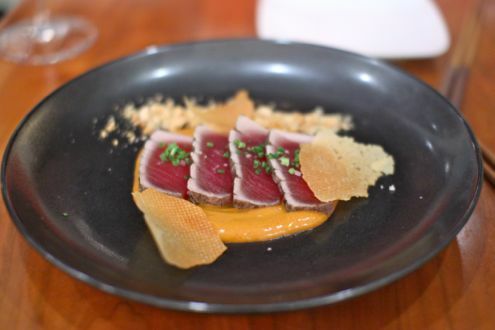 Adour covered two out of three of those prerequisites – they only offered a limited menu – but given that Alain Ducasse’s DC establishment serves entrees that are typically priced over $35, we made an exception to that last condition. With our party of six promptly seated for our 7:30pm reservation, the staff was already very hospitable given that one of our friends had brought their newborn along to dinner with a stroller. Adour isn’t one of the most baby-friendly restaurants in the city, but they were very courteous given the situation, though I think the highest honor should go to baby Micah himself. He was very well-behaved throughout the evening and barely made a peep. 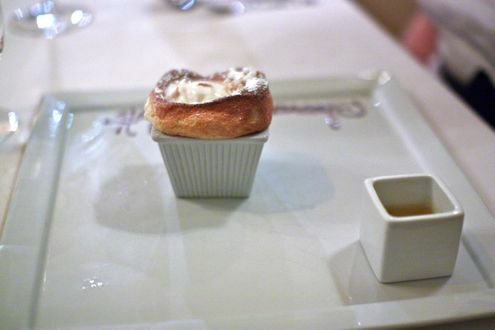 While reviewing the wine menu, our waiter dropped off a plate of warm gougères which were quickly devoured by the table. 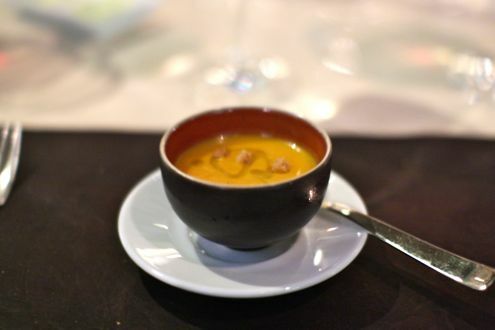 After placing our orders, we were presented with an amuse bouche of carrot ginger soup. 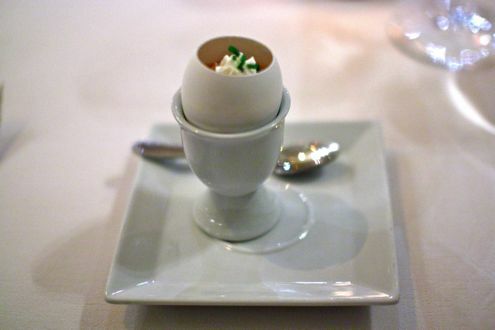 Delightfully creamy, it was a nice way to start the meal off. For our first course, I ordered the daurade ceviche. 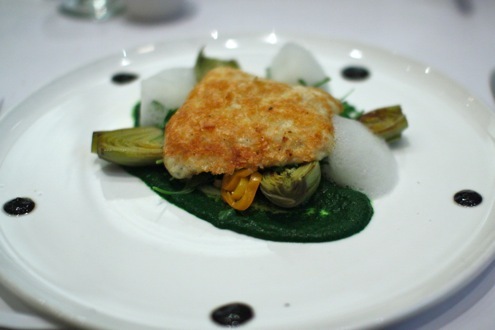 The fish, which was served atop a layer of avocado, was light and refreshing. On top of the daurade were kernels of fresh corn as well as popcorn. The latter was an interesting ingredient to say the least, both texturally and flavor-wise, but it was way too salty and contrasted with the protein. Rachel started off with the chilled heirloom tomato gazpacho with compressed watermelon and basil. She debated if this would be a worthwhile Restaurant Week choice given that fact that it was just soup, but after the first bite she knew she had chosen well. 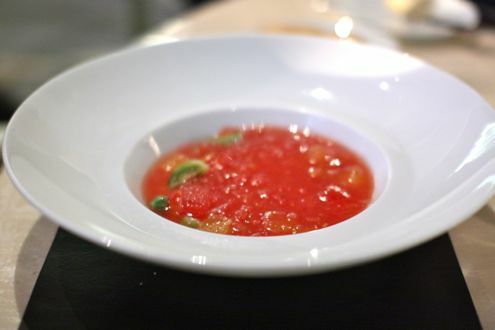 The flavor of watermelon was very prominent, and combined with the basil and tomatoes, it was one of the better gazpacho dishes she has tasted. 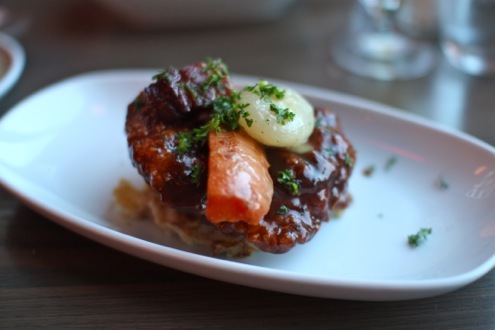 For our entrees, I went with the braised beef short rib. 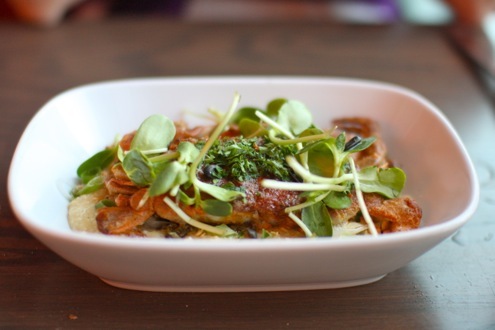 This dish easily made the meal for me as the short rib was simply outstanding. I barely had to use my knife since the meat was so incredibly tender. 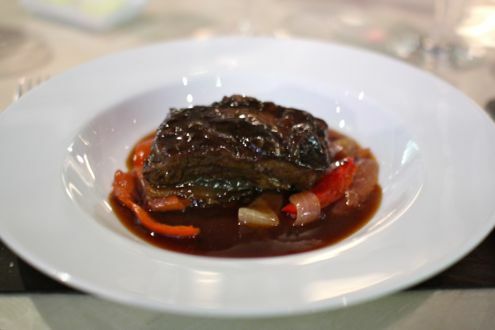 Served with sautéed onions, tomatoes, and peppers in addition to a side dish of creamy polenta, I can safely say that it was one of the best short ribs I have ever had. A bold statement, I know, but I was really blown away by the careful preparation of the chef. 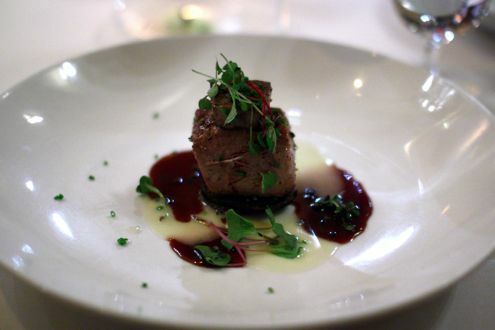 Considering that this entrée alone is regularly priced at $37, it’s a steal to say the least. For the entree Rachel ordered the seared Scottish salmon. It wasn’t the best salmon she ever had, but it was well-cooked and melted in her mouth. The mussels on top were a nice touch and overall it was a pleasing dish. After having a bite of the short rib she did encounter some ordering envy, but she happily cleaned her plate. As for dessert, I ordered the milk chocolate coffee bar. 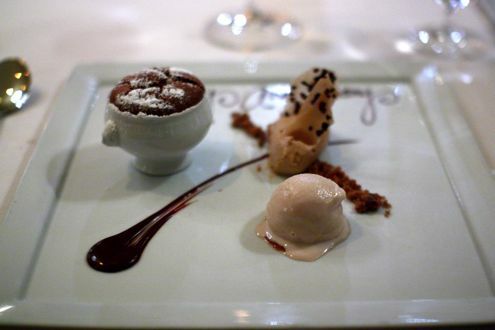 Served with a side of nougatine ice cream, this was a decadent ending to a great meal. 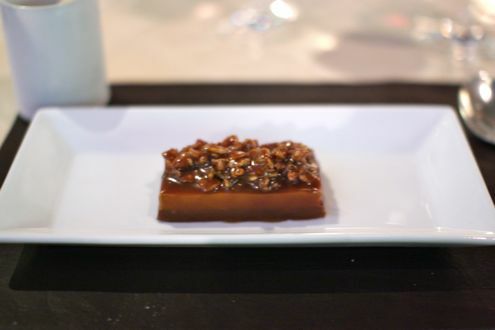 Adour’s spin on the Kit-Kat, I would take Ducasse’s version over Hershey’s 11 times out of 10. 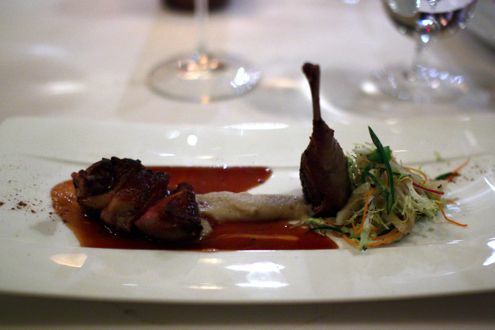 Topped with crispy rice drizzled with chocolate, it was incredibly hard to put the fork down. Then again, I had to in order to use my spoon to scoop out every last remnant of the homemade ice cream! 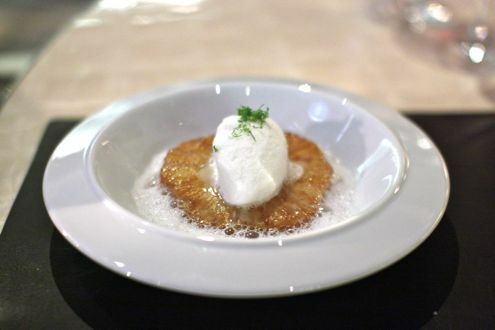 Rachel got the roasted pineapple with coconut sorbet. 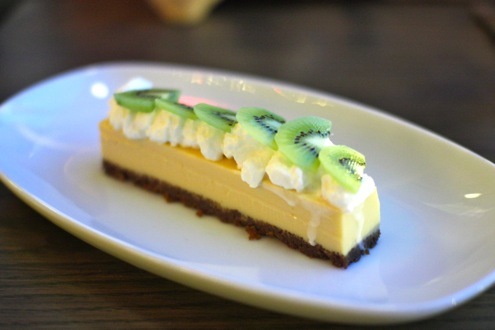 She loved the dessert as the flavors of coconut and pineapple blended together in perfect harmony. Even though she was full from the prior courses, it wasn’t too heavy as she was still able to fully enjoy her dessert. Overall, Adour was a fantastic meal. After reading some mixed reviews, I must admit that I felt I was going to be setup for a disappointment, but fortunately that was not the case. We had excellent service as they were very accommodating given our friend’s baby. 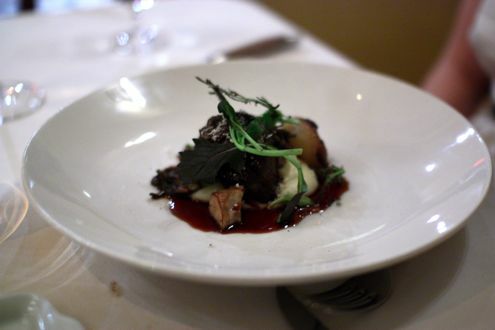 Despite the limited menu options, the food was excellently cooked and even transcendent at times (see: short rib). We even received some complimentary cookies before we got the bill. 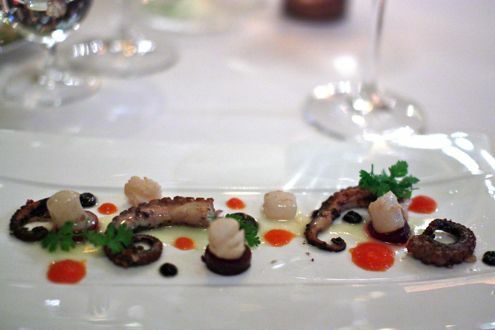 For all the flack Restaurant Week receives, Adour is a shining example of how it can succeed.